Taste + Cook – Emmer & Co. Whole life. Whole bird. Whole meals. Just as we think about the bird's whole life as we raise chickens, we also think about appreciating the whole bird as we cook. Each Emmer & Co. chicken can be made into at least three substantial meals. Roast a chicken for the main course, then make soup the next day. And simmer the bones for a bold, nutrient-packed broth. Our chickens taste like chicken. When we talk about chicken at Emmer & Co., we don't mean that bland breast on your sandwich, or the unadventurous option that's on every restaurant menu. To us, chicken means buttery, earthy, melt-in-your-mouth deliciousness. Wild-tasting, full of umami, and slightly sweet. It means the depth of flavor and incredible texture of a slow-growing bird that spent its life foraging on the pasture. This is how chicken was always meant to taste. 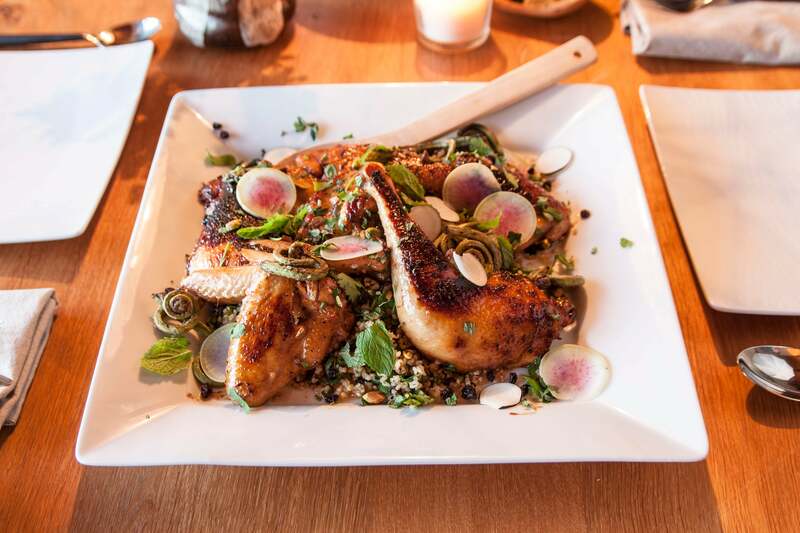 Chefs and home cooks alike seek out Emmer & Co.’s chickens for a rich depth of flavor that conventional poultry lacks. Active and proportioned like healthy, wild animals, these chickens have dense meat and well-developed legs that reflect their slow growth on pasture and their natural abilities to run and forage. The first time we cooked a pasture raised slow growth chicken, it seemed like we were tasting chicken for the first time. It was rich and savory, with a deep, hearty favor and dense texture that we’d never experienced with other poultry. After those first palate-changing bites, we sought to transform our favorite recipes by making them with boldly-flavored pasture raised birds. This small collection, developed with our friend Chef Jen Franco, is a sampling of recipes that highlight true chicken flavor and tasty seasonal ingredients. The right birds & methods.